It’s a common misconception that weight loss and fat reduction are the same things. They’re not. 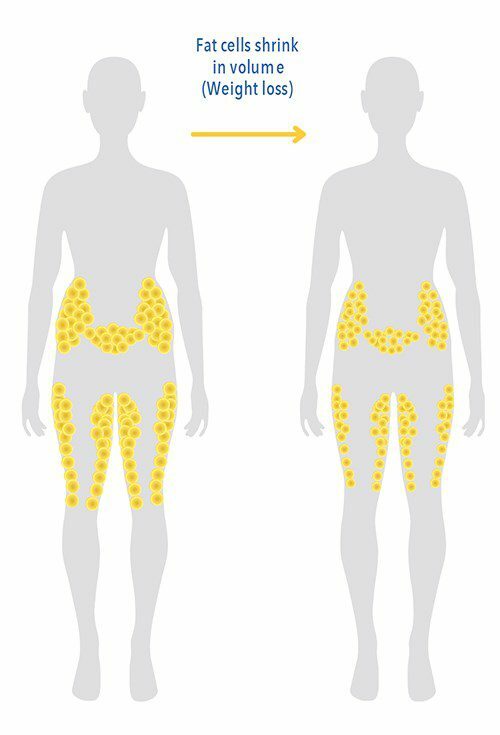 When we lose weight, our fat cells become smaller, but the number of fat cells remains the same. When we gain weight, those fat cells become larger again. Each of us has a set number of fat cells in our bodies that grow bigger or shrink down with weight gain and loss. Weight gain does not actually mean there are more fat cells in our bodies. The CoolSculpting procedure actually reduces the number of fat cells in the treated areas. Obviously, the fat cells that are no longer there can’t get bigger. Now you have fewer fat cells, and since your body won’t make anymore, you have fewer fat cells for life. And unlike weight loss surgery or other non-surgical weight loss procedures, results from the CoolSculpting procedure are lasting. Results are typically seen in 1-3 months after the treatment. * Whether or not you weigh less, you’ll be thinner, your clothes will fit better, and you’ll feel and look better.